State Bar Board of Governors - Information about the appointments made by the Supreme Court to the State Bar Board of Governors. Committees, commissions, councils and boards are composed of appointed members of the public, attorneys and judges who are responsible for making recommendations on issues affecting the court system statewide. Ad Hoc Committee on Rules of Evidence was established by Chief Justice Rebecca White Berch on March 24, 2010. See Administrative Order No. 2010-42. The Committee is charged with comparing the Arizona Rules of Evidence to the proposed restyled Federal Rules of Evidence, identifying differences, and providing input to the Supreme Court regarding conforming changes. If the Committee concludes that the Supreme Court should consider conforming changes to the Arizona Rules, it shall draft and file, not later than December 2010, a petition to amend the Arizona Rules of Evidence. Advisory Committee on Rules of Evidence was established by Chief Justice Rebecca White Berch on June 11, 2012. The Committee will periodically conduct a review and analysis of the Arizona Rules of Evidence, review all proposals to amend the Arizona Rules of Evidence, compare the rules to the Federal Rules of Evidence, recommend revisions and additional rules as the Committee deems appropriate, entertain comments concerning the rules, and provide reports to this Court, as appropriate. The Arizona Commission on Access to Justice was established by Chief Justice Scott Bales on August 20, 2014, by the entry of Administrative Order No. 2014-83. The Order directs this Commission to help serve the important Strategic Agenda goal of promoting access to justice for Arizona’s civil litigants. Arizona Commission on Judicial Conduct: (CJC) is an independent agency that investigates complaints against state and local judges involving violations of the Code of Judicial Conduct and ethics. Membership includes judges, attorneys and public members. Attorney members are appointed by the Arizona State Bar and public members are appointed by the Governor. Arizona Commission on Judicial Performance Review: (JPR) reviews the performance of the justices and judges appointed under the merit selection system, makes findings as to whether the judges and justices meet judicial performance standards, and provides the performance results to voters. Membership includes attorneys, judges and public members. 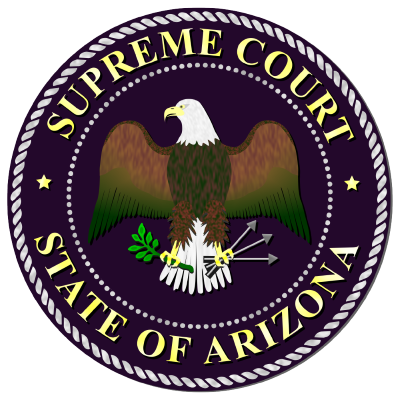 Arizona Judicial Council: (AJC) assists the Supreme Court and the Chief Justice in the development and implementation of policies and procedures for the administration of the state’s courts. Membership includes judges, court administrators, attorneys and public members. Arizona State, Tribal, and Federal Court Forum provides a forum for cooperation and communication among state, tribal and federal judges to improve the quality of justice delivered in overlapping jurisdictions. Membership includes federal judges, state judges, tribal judges, attorneys and public members. Attorney Regulation Advisory Committee (ARC) was created in accordance with Administrative Order No. 2011-44, to assist the Supreme Court and the Chief Justice on issues relating to attorney regulation. ARC will monitor implementation of the new discipline process, periodically review the entire attorney admission and discipline system, and make recommendations for any needed changes. Board of Certified Court Reporters makes recommendations on issues pertaining to stenographic and voice writer court reporters. Membership includes court reporters, judges, judicial staff, attorneys and public members. The Board meets regularly to review applications for initial and renewal of certification, to handle disciplinary matters, and to review and address matters relevant to Certified Reporters. Board of Legal Document Preparers makes recommendations on issues pertaining to certified non-lawyers who prepare legal documents without the supervision of an attorney. Membership includes legal document preparers, judicial administrators, judges, superior court clerks, attorneys and public members. The Board meets regularly to review applications for initial and renewal of certification, to handle disciplinary matters, and to review and address matters relevant to Legal Document Preparers. Capital Case Oversight Committee: established to continue examining the issues relevant to ensuring the availability of adequate resources for processing capital cases in Maricopa County and in the appellate courts of Arizona. Commission on Minorities in the Judiciary: (COM) assists the Arizona Judicial Council in removing barriers to achieving racial equality and equal justice, to increase the number of qualified minority applicants available for service as judicial officers, including pro tems and commissioners, and to expand the number of minorities employed as staff and professionals in the judicial department. Commission on Technology: (COT) establishes the goals, policies and priorities for statewide judicial information technology. The Commission studies and recommends improvements in technology and automation. Membership includes judges, attorneys, court clerks, court administration, and public members. Commission on Victims in the Courts: (COVIC) advises the Arizona Judicial Council (AJC) by reviewing and submitting policy recommendations and procedures to improve victim access and ensure fair treatment during their involvement in the criminal justice system. Committee on Character and Fitness assesses character and fitness to practice law of every applicant, based on Supreme Court guidelines, and makes a recommendation tot he Supreme Court of individuals who have passed the examinations required by the Committee on Examinations and who are deemed by the Committee to be qualified on the basis of character and fitness. Membership includes active members of the State Bar and public members. Committee on Examinations examines applicants for admission to the practice of law and advises the Supreme Court and the Committee on Character and Fitness regarding applicants who have passed the required examinations. Membership includes active members of the State Bar. Committee on the Impact of Domestic Violence and the Courts: (CIDVC) makes recommendations regarding policies that acknowledge the severity of the problem of domestic violence in Arizona. It recommends system changes that will promote enhanced safety for victims and the professionals who interact with them. Membership includes judges, attorneys, law enforcement, DV service providers and coalitions, and public members. Committee on Improving Small Claims Case Processing was established by Chief Justice Bales on November 2, 2016, by Administrative Order 2016-115. The committee is charged with developing recommendations, including rule amendments or pilot projects, to reduce the time required to resolve small claims cases in Arizona’s Justice of the Peace courts. Committee on Judicial Education and Training: (COJET) establishes education and training policies and standards for judges and court personnel throughout the state. Membership consists of judges, court administrators, probation chiefs and juvenile court directors, deans of law schools, and public members. Committee on Juvenile Courts: (COJC) was established to facilitate communication and problem solving among the juvenile court judges in regard to juvenile court matters. The Committee assists the Committee on Superior Court and the Arizona Judicial Council in the development and implementation of policies designed to improve the quality of justice; access to the courts; and efficiency in court operations. It identifies the needs of the juvenile court for all children facing delinquency and dependency issues within the jurisdiction of the court and for children otherwise involved in the judicial system. The Committee advocates for fair and equal treatment of children, plans for future developments of the juvenile system, and recommends uniform policies and procedures to improve juvenile court operations. Committee on Limited Jurisdiction Courts: (LJC) was established as a standing committee of the Arizona Judicial Council to assist the council and the Supreme Court in the development and implementation of policies designed to improve the quality of justice, access to the courts and efficiency in court operations; identify the needs and study the internal operation of the limited jurisdiction courts; and analyze and plan for future developments and recommend uniform administrative policies and procedures to improve judicial administration. Committee on Mental Health and the Justice System (MHJS) was established by Administrative Order No. 2018-71. The committee is a continuation of the Task Force on Fair Justice's Subcommittee on Mental Heath and the Criminal Justice System. The committee will develop and recommend comprehensive, evidence-based best practices and cross-agency protocols to improve the administration of civil and criminal justice for persons with mental illness. Membership includes judges, attorneys, court officials, law enforcement, behavioral healthcare professionals, and mental health advocates. The Committee on Probation (COP) was established in November 1990 as a standing subcommittee of the Committee on Superior Court (COSC). The COP examines current probation procedures, develops policies and procedures to improve quality, and promote standardization, consistency and coordination of probation procedures statewide. Committee on Probation Education (COPE) oversees the research and development of probation, surveillance and detention officer training, including Probation Officer Certification, Juvenile Detention Officer Academy, Faculty Skills Development and all officer safety training. Membership consists of judges, attorneys, probation chiefs and juvenile court directors, and public members. Committee on the Review of Supreme Court Rules Governing Professional Conduct and the Practice of Law: Established to examine the Rules of the Supreme Court on professional conduct and the practice of law to determine if changes are desirable in light of (a) changes proposed by the American Bar Association's Commission on Ethics 20/20; (b) the changing nature of legal practice in a technologically-enabled and connected workplace; and (c) the growing trend of multi-state and international practice of law. Committee on Superior Court: (COSC) assists the Arizona Judicial Council and the Supreme Court in development and implementation of policies designed to improve the quality of justice, access to the courts, and efficiency in court operations. The committee studies and recommends improvements in the internal operations of the Superior Court. Membership includes judges, administrators, clerks of the Superior Court and representatives from the Committee on Probation, the Arizona State Bar and the public. Confidential Intermediary Board: makes recommendations on issues pertaining to confidential intermediaries, adoption and sibling reunification specialists. Membership includes social workers, court staff, attorneys and public members. The Board meets regularly to review applications for initial and renewal of certification, handle disciplinary matters, and to review and address matters relevant to Confidential Intermediaries and the Sibling Information Exchange Program. Court Appointed Special Advocates (CASA): advocate for the best interests of abused and neglected children. CASA volunteers donate their time to help the court system determine what is best for children who have come under the court's care. Court Interpreter Program Advisory Committee (CIPAC): was established on November 20, 2015 with the issuance by the Chief Justice of Administrative Order No. 2015-98. To assist the Arizona Judicial Council carry out its responsibilities, the committee is charged with recommending policies for language access and credentialing of interpreters. Court Leadership Institute of Arizona (CLIA): oversees the development of education programs to promote court leadership, management and succession planning for all Arizona courts and probation departments. Membership includes leadership judges, probation chiefs, court administrators, second level managers and public members. The Court Security Standards Committee (CSSC) was established by Administrative Order No. 2015-104 to assess current court security practices in the Arizona courts, develop recommendations for court security standards, and develop recommendations for implementation of those standards. These purposes will be carried out with the assistance of the National Center for State Courts (NCSC). Defensive Driving Board: makes recommendations on issues pertaining to defensive driving schools and instructors. Membership includes court administrators, defensive driving school owners and instructors, judges, and public members. The Board meets regularly to review applications for initial and renew of certification, handle disciplinary matters and to review and address matters relevant to Defensive Driving. The Fiduciary Board: makes recommendations on issues pertaining to court appointed conservators, guardians, special administrators, and personal representatives. Membership includes public and private fiduciaries, judges, court administrators, attorneys and public members. The Board meets regularly to review applications for initial and renewal of certification, handle disciplinary matters, and review and address matters relevant to Fiduciaries. Foster Care Review Board: (FCRB) advises and makes recommendations to the juvenile court on progress toward achieving a permanent home for a child or children involved in a dependency action and in an out-of-home placement. There are Boards in each county and five volunteer members on each Board. Judicial Performance Review (JPR) Conference Teams: are involved in the self-evaluation component of the judges’ performance reviews. The Conference Teams meet with the judges during the review period to discuss survey results and assist in setting education and improvement goals. Membership on each team includes a public member, an attorney member and a judge member. Conference Teams are appointed each general election year. Judicial College of Arizona: (JCA) oversees education and training for all Arizona limited jurisdiction, general jurisdiction and appellate judges. Membership includes judges, law school professors, attorneys and public members. Judicial Ethics Advisory Committee: (JEAC) issues advisory opinions interpreting the Code of Judicial Conduct and the Code of Conduct for Judicial Employees. Membership includes judges and public members. Judicial Nominating Commission: (JNC) interviews candidates for judicial openings and submits a list of candidates to the Governor for selection under Arizona’s merit selection system. Membership includes the Chief Justice, attorneys and public members who are appointed by the Governor and confirmed by the Arizona Senate. Judicial Staff Education Committee (JSEC): oversees the development of education programs for judicial personnel who are not judicial officers or probation officers. Membership includes courtroom clerks, interpreters, judicial assistants, court security, bailiffs, court administrators, information technology managers, support staff, training coordinators and public members. Legal Services Task Force (LSTF): The Task Force on Delivery of Legal Services (LSTF) was established by Administrative Order 2018-111. This Order directs the Task Force to further the Judiciary’s Strategic Agenda goal of “Promoting Access to Justice” by reviewing the regulation of the delivery of legal services in Arizona. The Task Force will focus on how rules and codes governing the practice of law in Arizona can be revised to improve the delivery of legal services to consumers. Post Conviction Actions Task Force: The Post Conviction Actions Tasks Force began as a subcommittee of the since expired Fair Justice for All Task Force. Seeing the need to continue examining these issues, the Court established the Task Force by Administrative Order No. 2018-52. This Order directs the Task Force to consider proposed amendments to statute and rule relating to the setting aside of criminal convictions, restoration of civil rights, and the setting aside and disposition of records of juvenile adjudications. Probate Rules Task Force: The Task Force on the Arizona Rules of Probate Procedure was established by Administrative Order No. 2017-133. This Order directs the Task Force to review the Arizona Rules of Probate Procedure, to identify possible changes to conform to modern usage, and to clarify and simplify language. The goal of the Task Force is to submit a rule petition with any proposed rule changes by January 2019. Rule 32 Task Force: The Task Force on Rule 32 of the Arizona Rules of Criminal Procedure was established by Administrative Order No. 2018-07. This Order directs the Task Force to identify substantive changes that could improve upon the objectives of Rule 32 and the post-conviction relief process. The goal of the Task Force is to submit a rule petition with any proposed rule changes by January 2019. Steering Committee on Arizona Case Processing Standards reviews the National Time Standards for processing all major case types in the limited and general jurisdiction courts, develops and recommends state case processing standards for Arizona and makes high level recommendations for implementation of the case processing standards. The Task Force on Fair Justice for All was established by Chief Justice Scott Bales on March 3, 2016, by Administrative Order No. 2016-16 to promote "justice for all," meaning that people should not be disparately punished because they are poor. While everyone should face consequences for violating the law, criminal fines and civil penalties should not themselves promote a cycle of poverty by imposing excessive amounts or unduly restricting people’s ability to be gainfully employed. The goal of the Task Force is to file a report and make recommendations by October 31, 2016. Click here for disbanded committees not listed above. Some court related committees and commissions have members who are appointed by the Arizona Governor or the State Bar of Arizona.